I'm a big ginger fan, ginger beer, ginger brandy ,and when I saw ginger wine my eyes lit up like a kid looking at the Sears wishlist. The Whisdy Mac is a simple drink but packs a punch and delivers a unique taste. You can play with the parts ratio. 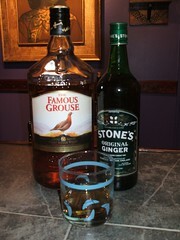 Some call for equal and others add the ginger to taste. Carefully pour the Ginger Wine into the scotch without disturbing it much and enjoy. i am a fan of having cigar and whisky both, i buy cigars from all over the world. The information in this blog regarding whiskeys is good and its adding to my knowledge.